I published a piece in The Jerusalem Post‘s Metro section about Masada street, the vibrant, bohemian center of Haifa’s Hadar neighborhood. The piece, titled “Haifa’s Florentin,” (which references a hip neighborhood called Florentin in Tel Aviv), profiles the neighborhood and describes some grassroots efforts being made here. It also examines what coexistence means for people living in this mixed Jewish-Arab neighborhood. Since the article is pay-walled, I have copied the article below. As always, let me know what you think. While the municipality could do more to renovate the ill-kempt Hadar neighborhood – one of the country’s most diverse – grassroots efforts are being made to promote coexistence and encourage community activism. 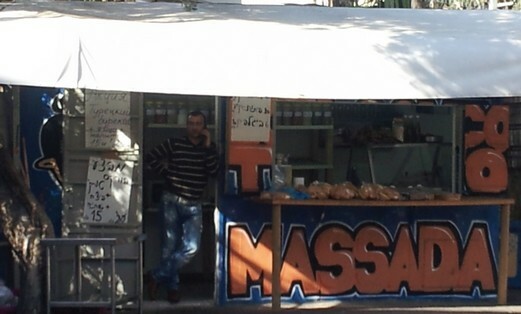 Approaching Masada Street in Haifa, a small bakery kiosk with “Masada” written in orange and blue graffiti welcomes you. The kiosk offers the usual fare: burekas, chocolate and cheese baked goods, and of course, pita. But on a large plate next to the cashier, the bakery displays a food combination this reporter had never seen before in Israel: halla with za’atar. This unusual fusion symbolizes a lot about Masada Street. It is one of the few places in the country where Jews and Arabs live side by side. This street is the bohemian heart of Hadar Hacarmel, which is one of the country’s most diverse neighborhoods: Jewish Israelis, Arab Israelis, Russian immigrants, students and foreigners all reside here. 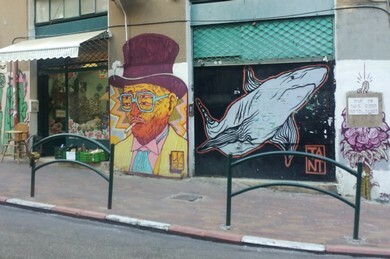 Many of the street’s buildings are adorned with graffiti art reminiscent of Tel Aviv’s Florentin neighborhood, and a good number of store names are written in Hebrew, Arabic, English and Russian. At Café Masada, the street’s signature neighborhood café, one often hears snippets of political, left-wing conversations. Similar to Florentin, many of Hadar’s buildings look ill-kempt, and one can tell that the neighborhood, although colorful, could use a face-lift. Nestled between Arab neighborhoods Wadi Nisnas and Wadi Salib, Hadar has historically been characterized as a Jewish immigrant neighborhood. The peak periods of the neighborhood, created at the beginning of the 20th century, coincide with the largest waves of Jewish immigration: in 1948 when many Holocaust survivors settled in the area, and in the early 1990s when many newcomers from the former Soviet Union were first absorbed there. However, both groups treated Hadar more like a launching pad than an ideal destination. Some Russians have stayed in the area, largely because of economic constraints. Most of the neighborhood’s residents are lower income, and many of the neighborhood’s buildings have suffered from years of neglect. Although this is a solid effort, it seems more could be done to improve the neighborhood’s infrastructure so that it can become a desired, long-term place of residence. Instead, the city has focused more attention on bringing young people to the neighborhood. In partnership with the Haifa Municipality, the University of Haifa and the Jewish Agency, a student village – Kfar Hastudentim – was created in Hadar in 2007, shortly after the Second Lebanon War. Students participating in the project move to Hadar and receive a NIS 14,500 scholarship. In exchange, they do community work with Hadar residents, such as facilitating youth groups, community organizing, assisting the elderly population and coexistence projects. So far, around 200 people have participated in the program, 50 of whom have remained in the neighborhood. Noam Fonia, a 27-year-old Technion student, moved to Hadar a year ago and has been active in the student village. He thinks the neighborhood is “fascinating… There are a lot of groups, communities, activities and good people. He is involved with a project that helps teenagers in the neighborhood, and he likes it a lot. When asked if he plans to stay in Haifa after he graduates, he says, “Yes, I would like to stay in Hadar if I can. That’s the plan.” But he will need to find work in order to stay in the area. Perhaps he will follow in the footsteps of activists such as 32-year-old Shai Nir, who manages Hadar’s Community Center. Nir moved to Hadar seven years ago from Jaffa. He says he moved from that mixed Arab-Jewish area because “Hadar is more mixed. It’s more like Israeli society: Arabs and Jews, immigrants and veterans, religious and secular. At the Elika Art Bar Café, where an Arab artist’s paintings, a Che Guevara poster and Banksy prints line the walls, an amusing cross-cultural interaction is taking place. Two older Americans are sitting with a Jewish Israeli man in his 60s. One of the Americans proudly tells the manager, who is Arab, that they are all attending their first Arabic lesson tonight. The manager smiles, says that’s great, and then continues to talk to his co-worker in Arabic. In fact, whenever this question is asked, the term “coexistence” feels a bit like a dirty word. Var Kevenbrov, the cofounder of MishMash, flatly states, “Yes, there’s coexistence because everyone is living here together.” She then laughs, not knowing what else to say. It appears that the words “coexistence” and “reality” do not mix. Coexistence perhaps connotes a state of utopia where people live in harmony. Although folks who frequent Masada Street do interact with each other, often forming close bonds, the mere word “coexistence” seems to gloss over the challenges each community faces: discrimination felt within the Arab community, economic hardships and challenges integrating the Russian community. Even though the student village and other social groups work with Russians, their presence can hardly be felt in hip, younger areas such as Masada. Everything is done in the three main languages of its clientele – Hebrew, Arabic and English – so that everyone can be understood. He hopes this open atmosphere – where films and music are played, art and books are discussed, and alternative thinking is constructed – encourages people to create change. Not surprisingly, Masada’s peak hours are in the evening. When choosing what to eat for dinner, one is likely to order street food – hamburgers, empanadas, chorizos, pizza, felafel and the like. Music is playing, people are conversing, but there’s one big thing missing: foot traffic. Masada Street’s multicultural bohemian epicenter is only two blocks long. It is hard to believe this because there is so much activity in these two blocks. While sitting at any café in the area, one could not see a passerby for a span of five minutes. Many of the smaller cafés have only half a dozen customers in an hour. This entry was posted in Cultural, Peace & Justice, Published and tagged Coexistence, Graffiti, Hadar, Haifa, Jewish-Arab, Massada Street, Student village, Urban Planning, Urban renewal by Laura Rosbrow. Bookmark the permalink. A great read Laura. Thanks for showing some of us here in America what it means to embrace different cultures in a fashion of desired future outcome positive for all facets. Very interesting! I have been living on Masada St. since 2002. But let’s not be naive about coexistence. Everyone coexists. It just so happens we all live together. No one believes that it is reality. Another condescending view of our neighborhood. Massada is not Hadar. A student colony pumping up rent through subisides; a municipal vision of gentrification and ejection of the ‘unwanted’ populace; Gush Dan real-estate speculators squeezing every last Shekel out of our pockets. And of course, only settlers are interviewed, no long-time residents. No Arabs, not even Russians(/Ukranians/Kazakhs/etc.) they’re objects, not subjects. They don’t really exists, their streets don’t exist, nothing but ill-kempt background to the cultural wonder. You are not wanted here. I appreciate your comment. Both an Arab and a Russian are interviewed (the owners of Elika and Mishmash) in the piece. Regarding your other points, thank you for telling me what I should look into further. What do you think long term residents of the neighborhood think about all of these developments? They know the municipality does not have their interests at heart, and some clearly sense a hostility from it. Of course, I haven’t taken any sort of survey, I only talk to people I meet (and I know some Arabic but not Russian so I’m limited in that respect). They are generally quite demoralized – not only is employment scarce, but apartment prices have shot way up – both for purchase and for rent. They see how the city can pour millions on garden patches around the Carmel ridge main streets, or on that ridiculous stadium – but they get squat. Or rather, foreigners get money to come settle in their neighborhoods. And, obviously, neither the students, nor the, shall we say, semi-bohemians, nor the religious racists are interested in interacting with them. 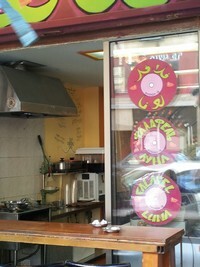 Russians and most local Arabs don’t frequent the cafes on Massada street, ever. At best – the community centers, and even those not so much (maybe in Jerusalem street more than Tveria). Weak article. Very superficial. Does not really give an inside look into the (indeed) small but unique and sometimes vibrant (in its own way) Masada experience. Does not give a feel for what it is and what really goes on there, for example, the political, poetry and musical events at Cafe Masada and Mishmash, the Broken Fingaz graffiti and music experience, the used bookstore, the colorful characters that make up the scene there (e.g., the Zebra owner), the poverty, the clashing of cultures, the street parties and festivals, the exceptional community center in that neighborhood and all the great things it has to offer, etc., etc. The journalist didn’t even talk to the main figure who’s been deeply involved for many years with the whole vision of culturally upgrading the Hadar and whose name I won’t mention without his permission. And, furthermore: Why the stupid comparison to Florentine? Masada has almost nothing in common with Florentine (other than the poverty>gentrification mentioned above). On the contrary, to a certain degree, Masada is trying to be anti-commercial and anti-establishment. The colourful character from Zebra runs the place without a licence and against the law. He is in violation over 10 different health code laws. A petition made up of people close to the place passed around a written complaint to the city on three separate occasions to shut him down. And do you really know what really goes on `Masada’? I appreciate you wanting to teach me more about the neighborhood. Offline, please do email me who you think is the main figure of the neighborhood. Perhaps I can do a follow up article. While the YMCA preschool has existed for almost two decades, parents in Jerusalem have been without a mixed class once their children enter elementary school. Two years ago a group of educators formed the Center for Jewish-Arab Education in Israel and opened the Galil School, a first grade class within the large Misgav public school in the Galilee. This year a second grade class was opened. They plan to add a grade each year until they have a complete elementary school and their own building. Next year the center plans to open a Jerusalem branch of the school in the Talpiot or Bak’a neighborhood. I rode with a small group of parents who were going up to the Galil School to meet with the teachers and observe the classrooms. Many of these parents now had children in the YMCA preschool and were hoping that the new school would meet their needs. The small van was full of Arab and Jewish parents speaking in Hebrew, then Arabic. The ride took us through the desert next to Jordan and then into the beautiful fields of kibbutzim in the Beit Shean valley, and finally into the Galilee – an area inhabited by Jews and Arabs in separate villages. Hi, I am french non jewish and i grew up in a very mixed subburban area close to Paris, most of my childhood friends were africans and arabs. Recently I met my girlfriend who is israeli jewish and lives in rishon lezzion. Ive spent 3 months living with her in Israel and it was sad to realize that she had absolutely no arab friend, that none of her friends or relatives did, that they were not interested at all in knowing about arabic language or culture, and that all they could tell me about them was that “they are more dangerous and violent” and other similar cliches. Added to that personal experience, I have also read in several books and articles that the two communities live completely separated in the vast majority of the country. She then told me that I was generalizing too much and that some cities like Haifa saw the two cultures mixing or “co-existing”, however u call it. Thats how i googled it up and found this article. It was very interesting, but I’m still wondering about a few things: does “coexistence” in this district of Haifa means that israeli jews and israeli arabs muslims can be friends there (I mean real friends that share ideas, moments, laughs, dreams, etc, not just acquaintances that may come to talk to each other because they live in the same area…)? Is this something common in the whole city of Haifa or just in this specific street? Would you say this kind of “coexistence” is very rare in israel? Does it exist in other places like Jaffo for example? I’ve also read that the rare places where arabs and jews blend are universities, hospitals and construction business… But again, i wondered if it means they can become friends and instore a real communication, of if this coexistence remains mostly superficial. I’d be interested in hearing everybody’s point of views, iraeli arabs as well as israeli jews. Thanx in advance! Hi, sorry it took a while to respond to your important questions. Yes, some Israeli Jews/Arabs in Haifa do have real friendships. Of course, not everyone, but this is more common here than in many other places in the country. This is not to say that there still aren’t tensions/gaps (as mentioned in my article), but yes, it does happen. And you are right that Arabs/Jews mix more in certain settings, such as universities. I’d also like to add in business, such as high-tech. Yafo is also a mixed city, and coexistence exists there more as well. Although some people do forge friendships, you are accurate in that sadly, most of these interactions remain largely superficial. That’s at least been my experience. And you are right that in most of the rest of the country, these groups are almost completely separated. But if you are interested in exploring coexistence more, than yes, I’d recommend visiting Haifa, Yafo, and also Neve Shalom, an intentionally mixed village.